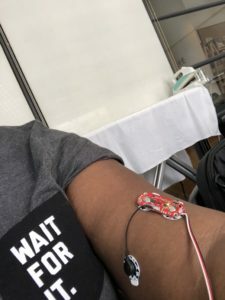 After experimenting with both the muscle and pulse sensors (and seriously considering buying both for myself), I sat down and tried to figure out what I wanted to do as a wearable project. I knew that I wanted to use the MyoWare Muscle Sensor as my sensor, but didn’t know what action I wanted it to trigger. I decided to jump in, and see if I could get it to make a servo move. I figured that if I could get that interaction to work, it might inspire some sort of interactive wearable. Initially, I couldn’t get the servo to work, but thanks to Chester’s help, I was able to get it wired correctly. 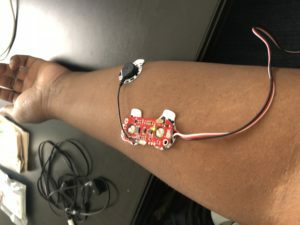 While it’s not quite as smooth as I’d like, I was able to get the servo to move in time with the input from the muscle sensor. In the arduino code, I worked on adding code to both calibrate, and smooth out the motion on the servo. It’s still a work in progress, but it’s a beginning. IMG_1881 from Kellee Massey on Vimeo. For the project, I decided to make a rotating boutonniere. I kind of stumbled onto the idea while working on my project in the lounge, while sitting with a group of itp’ers. I was holding the servo on different body parts and trying to figure out what I could do with it that would be interesting, when Stevie suggested maybe using a flower on the servo. Initially, I was thinking about a brooch, or pin, but eventually settled on the idea of a boutonniere. I found the idea of a person in high school, going to prom, and showing up at their date’s house with a rotating boutonniere (maybe with LEDs?) to be pretty entertaining. For the sake of wearability, it’d be battery powered, with the arduino and servo contained in lightweight box inside the jacket. 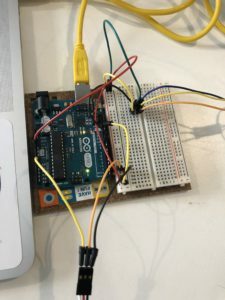 While I’d thought about a pouch or some other cloth container, I want to make sure that the arduino and servo are supported and in a fixed position so that it doesn’t move around. Going forward, I’d like to get the flower attached to the servo, and work towards smoothing out the movement. Ideally I’ll be able to work out some way to smooth out the jitteriness of the movement. Once that’s finished, I’ll move on to putting together a container of some sort to hold the unit inside of a suit jacket. All in all, I’m pleased with the beginnings of the project, and can’t wait to improve, and finish it.